An HH-60G Pave Hawk prepares to land after training in Lungi, Sierra Leone. The Air Force introduced the first of 21 fully built HH-60G Operational Loss Replacement helicopters at a ceremony in Huntsville, Alabama, on June 28, 2016. The Air Force introduced the first of 21 fully built HH-60G Pave Hawk Operational Loss Replacement (OLR) helicopters June 28 at a ceremony in Huntsville, Ala. The HH-60G is used to conduct combat search and rescue operations. 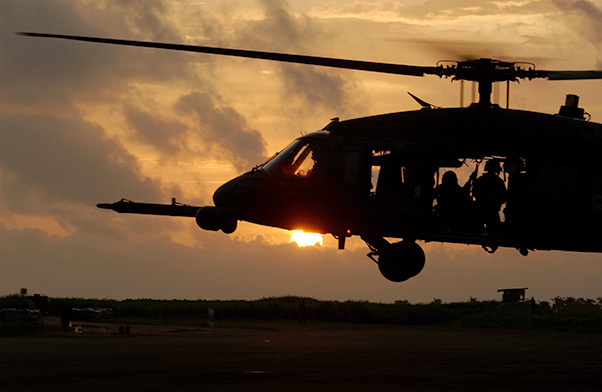 The OLR program will restore the service’s HH-60G fleet to its authorized size, replacing aircraft lost in nearly 15 years of deployed combat operations since 9/11. The Air Force acquired 21 UH-60Ls and added a comprehensive kit of modifications and additional equipment to convert them into HH-60Gs. The service ensured the baseline helicopters they received from the Army were well-maintained, structurally sound aircraft with no systemic maintenance problems. 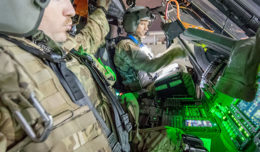 The Air Force worked with the U.S. Army Aviation and Missile Command to contract Science and Engineering Services LLC (SES) to modify the initial UH-60L aircraft. This effort began in October 2012 and required the program office and SES to integrate all of the modifications implemented on the HH-60G fleet throughout its more than 30-year history into a single technical data package. As a result, the aircraft introduced June 28 will have several systems upgrades that are only now beginning to reach the rest of the HH-60G fleet. Units scheduled to receive the re-missionized helicopters will see a marked improvement in sustainability from the aircraft they’re currently flying, as numerous aging and obsolescent systems were modernized to match today’s state-of-the-art capabilities. 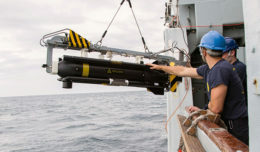 These include color weather radar, a digital symbol generator, improved tactical air navigation, new radar warning receivers, an automatic direction finder, and a digital intercommunication system. The Air Force will use the OLR program as part of an overall fleet management strategy. Air National Guard rescue units in California, Alaska, and New York will receive OLR aircraft in fiscal year 2018 after initial testing, while former Guard aircraft will re-flow to active units with the highest number of flight hours. The OLR aircraft will cut the Guard’s average fleet age in half. The Air National Guard units receiving the OLR aircraft are the 210th Rescue Squadron at Joint Base Elmendorf-Richardson, Alaska; the 101st RQS at Gabreski Field, N.Y.; and the 129th RQS at Moffett Federal Airfield, Calif.
Augmenting the fleet with the OLR helicopters ensures the service is ready to conduct personnel recovery and combat search and rescue missions until the modernized combat rescue helicopter enters service after 2020.